Edward Sheffield (Jake Gyllenhaal) is a young romantic, who works at a library and has dreams of becoming a writer. Susan (Amy Adams), heiress of rich Texan parents, is studying in NYC towards her master's in art history. After a brief encounter in the streets of NY, Susan invites him to dinner and sparks fly. A year later, Susan, in conversation with her mother (Laura Linney), announces that she is going to marry Edward. Her mother advises Susan against it on the basis of him having no money, no prospects, and being weak. Time will tell if you really don't have material concerns, she says. Two years after their marriage, Susan resents in Edward his lack of ambition and keeping alive the dream of becoming a writer despite showing no promise as such. She still loves him but has become very unhappy, this coinciding with meeting a "handsome and dashing" young man named Hutton (Armie Hammer). Fast forward nineteen years... Susan and Hutton are beautiful, rich, and still together, but they have grown apart. They own an art gallery together, and Susan has become a respected and successful artist. Hutton, under the cover of a failing business and constant travel, is having an affair with a younger woman. On a weekend in which Susan is alone and on edge due to lack of sleep, a package addressed to her is left in her mailbox. The package contains Edward's novel, about to be published, which is dedicated to her. Intrigued, Susan begins reading the novel about Tony Hastings and family's road trip to West Texas gone horribly wrong. As Susan reads, she is forced to confront some hard truths about what went wrong in her relationship with Edward and the life she is living with her second husband. 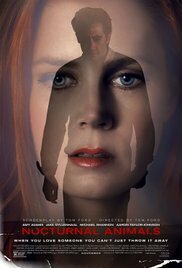 Nocturnal Animals, directed by Tom Ford, is one of those movies that packs a punch in an understated way. It gives voice to stuff from nightmares, how life can go wrong on account of acts of violence as much as on account of making bad choices. I found this movie devastating in a quiet yet powerful way. Music, sound effects (such as muffled screaming, rain falling, and heartbeats) and even make up (aging effect) are used to maximum advantage to convey desperation, loneliness, and even the realization that time gone cannot be brought back. Nocturnal Animals is first narrated linearly (in the present time), and then, in flashbacks, we get the puzzle that was the relationship between Edward and Susan. Also in flashes, more or less parallel to Susan's reminiscing, we see the story of what happened to Tony Hastings and his family. It may seem a rather "busy" way to visually narrate all these subplots, but it works to perfection. I have emphasized the technical successes of the movie, but cannot fail to recognize the achievements of the ensemble cast. Each character is flawless, from Andrea Riseborough and Michael Sheen as a rich, mismatched couple, to Michael Shannon as the nothing-to-lose Lieutenant Bobby Andes (role for which he won an Oscar nomination as Best Supporting Actor), to Aaron Taylor-Johnson as outlaw Ray Marcus—performance for which he should have been nominated to the Oscars in the same category. Gone is the dashing Taylor-Johnson's Count Vronsky in the 2012 theatrical- movie adaptation of Anna Karenina opposite Keira Knightley; as Ray Marcus, he gives the audience goosebumps, looks the part, and seems to have a mighty good time toying with Tony. Last, but not least, I must mention Jake Gyllenhaal, who is nothing short of brilliant in his two fully exploited roles, and Amy Adams whose nuanced performance is a welcome change as leading lady; most of her most successful roles have been in a supporting capacity to heavyweight actors such as Meryl Streep, Phillip Hoffman Seymour and Joaquin Phoenix, and no doubt Adams has learned from the greats, as she hits the ball out of the park even when she is not talking. This is a nice review. I really get a sense of this movie and feel that it is something I might like to watch. Funny, I had forgotten all about it until your review, even though it stars actors that I thoroughly enjoy watching. Thanks, Dorothy! If you decide to watch it, it is not a movie to enjoy but I hope you appreciate it. I like your new blue look! And I am anticipating this movie! It is in my Netflix queue, set to release next week. One of your best movie reviews ever in my opinion. I thought it was time for a new change of look in the site. Wow, Judy, thanks! I think you will "like" this movie, but try to go as blind as possible because I discovered that the movie is not what most people say it is about. To really trigger my creative juices I had to watch it twice, and I feel it held up great in the second viewing. Come back and tell me what you thought. I just watched this - it was really gripping, shocking and a little bit terrifying. The sort of film that afterwards you think about - a lot. Compelling viewing if you ask me. Thanks, Lynn! I agree with you, compelling and eerie...The music gave me chills. I'm glad you liked this one Carmen. It was eerie and scary at points. It had a thought-provoking ending. I agree. For me it was one of the most intriguing and original movies of the year. Well, I finally watched this one and I have to say, I was disappointed. The imagery was amazing and I felt like the story had so much potential but it ended up just sort of laying there. I thought the second half was very anticlimactic. Also, I couldn't decide whether the music was fitting or melodramatic. I guess it just wasn't for me. Too bad this one didn't work for you. Even though I still have a few movies to watch of the ones nominated to the Oscars in the major categories, so far this one has been my favorite. I thought it was very close to perfect.